Island Santa tells the story of Sam who lives in a remote coastal community. When his sister Sophie becomes ill shortly before Christmas, a water taxi takes her to a hospital in the city. When the Santa boat arrives on its annual tour to bring gifts to the children, Sam is sad because Sophie is not there, but cheers up when the skipper of the boat offers to take Sam to the city at the end of the tour. Sam goes aboard and helps out as the Blue Fjord delivers Santa to Christmas celebrations in other communities. Eventually they arrive in Victoria and Sam is reunited with his father and sister. 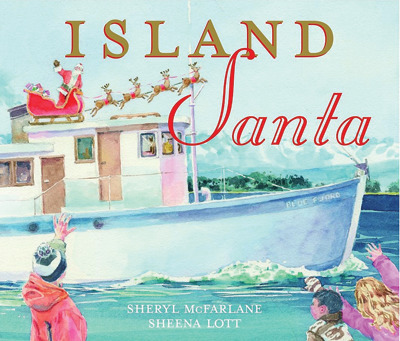 Island Santa is illustrated with beautiful watercolour paintings like those that we’ve loved in Sheena Lott’s other books. The paintings tell the story in pictures and provide evocative images of life on the coast. Classroom Connections: This is a very beautiful picture book that could be used to explore how coastal people depend on the ocean for transportation and how people depend on each other in small communities. The text is rich with language that relates to the ocean environment. It would make a wonderful addition to any collection of stories for December’s holiday season and lends itself well to teaching the reading comprehension strategies of making predictions, asking questions, making connections and visualizing.